Galatians 1: 3: Grace be to you, and peace, from God the Father, and from our Lord Jesus Christ. The greeting of the Apostle is refreshing. Grace remits sin, and peace quiets the conscience. Sin and conscience torment us, but Christ has overcome these fiends now and forever. Only Christians possess this victorious knowledge given from above. These two terms, grace and peace, constitute Christianity. Grace involves the remission of sins, peace, and a happy conscience. Sin is not canceled by lawful living, for no person is able to live up to the Law. The Law reveals guilt, fills the conscience with terror, and drives men to despair. Much less is sin taken away by man-invented endeavors. The fact is, the more a person seeks credit for himself by his own efforts, the deeper he goes into debt. Nothing can take away sin except the grace of God. In actual living, however, it is not so easy to persuade oneself that by grace alone, in opposition to every other means, we obtain the forgiveness of our sins and peace with God (1). The world brands this a pernicious doctrine. The world advances free will, the rational and natural approach of good works, as the means of obtaining the forgiveness of sin. But it is impossible to gain peace of conscience by the methods and means of the world. Experience proves this. Various holy orders have been launched for the purpose of securing peace of conscience through religious exercises, but they proved failures because such devices only increase doubt and despair (2). We find no rest for our weary bones unless we cling to the word of grace. The Apostle does not wish the Galatians grace and peace from the emperor, or from kings, or from governors, but from God the Father. He wishes them heavenly peace, the kind of which Jesus spoke when He said, “Peace I leave unto you: my peace I give unto you.” Worldly peace provides quiet enjoyment of life and possessions. But in affliction, particularly in the hour of death, the grace and peace of the world will not deliver us. However, the grace and peace of God will. They make a person strong and courageous to bear and to overcome all difficulties, even death itself, because we have the victory of Christ’s death and the assurance of the forgiveness of our sins. (1) I was visiting a hospice patient. When it came for Scripture time, I spoke about the text regarding God’s grace in Jesus Christ for sinners. She started weeping. I asked her why she was crying. She said, “It’s so good to hear that”. 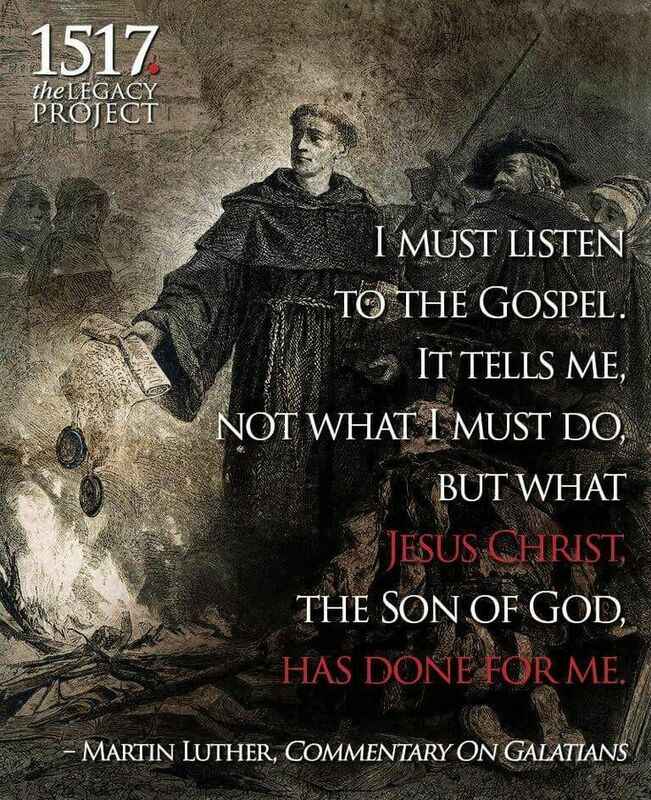 I said Martin Luther agreed: when it comes to justification by grace through faith, we need to hear it everyday because we forget it everyday. She nodded in the affirmative. A person can not “persuade oneself” about so great a salvation by grace alone by one’s self alone, but we need to hear it from someone else: encouraging, preaching, teaching the Lord Jesus’ atonement. This comes from the preacher, a teacher or a dear friend in Christ. Faith comes from the outside in, through the ear to the heart, not the inside out where there is corruption in the flesh, in the heart. The world’s religions only go from the inside out, and this includes too many religions that bear the name “Christian”. So we need the Divine Service to hear our forgiveness in the Lord in so many ways: Confession and Absolution, the Scriptures and the Sermon, the confessional hymns, the sharing of the Peace of Christ and fully: His Body and Blood. Truly, the Divine Service is Gottesdient: God’s Service to us. We are fed and so we are led. (2) “Holy orders” in the 16th century were in superabundance: monasteries and convents. The works righteous theology was if you really wanted to be saved then become a monk or a nun. At one time, Luther thought this as well until the revelation of the Gospel, the Lord’s “grace and peace” alone through the death and resurrection and Jesus Christ awoken faith in Luther. We do not see many monks and nuns in our day, but we do see their popular equivalents on TV, who promote all sorts of “religious exercises” in order to insure “to gain peace of conscience”, e.g. the exercises of Joseph Smith, Mohammed, Joel Osteen, etc. etc. In fact, from the ’60s to the second decade of the 21st century we have been drowning in religious movements, from EST to your Best Life Now. But like Paul Simon sang, “The nearer your destination, the more you keep slip sliding away”. And all these purveyors of peace have a price for their ‘salvation’: $$$$. They say, “love, love” but their is no love. The Lord paid the price once and for all, not with silver or gold but the precious blood of His Son. He so loved that our salvation is done.